Did conflict drive the evolution of the human brain? Over the course of human evolution our brain has increased dramatically. 7 million years ago our brain could’ve easily fit in a coke can; now you’d struggle to squeeze it into one of those giant “sharer” bottles of pop1. Obviously this dramatic increase in intelligence has granted our species many benefits; which has scientists fascinated. Which of those advantages drove the brain’s evolution? Researchers have come up with several theories and it’s become increasingly apparent that no single one is correct. Our big brains appear to be the result of many evolutionary forces operating on us. But have we overlooked one factor entirely? That’s the contention of a researcher from Australia, who recently published research arguing that conflict was one of the key forces driving the evolution of primate intelligence. He examined how much the territory of groups overlaps with one another in more than 100 primate species; which he then compared to the brain size of these species. 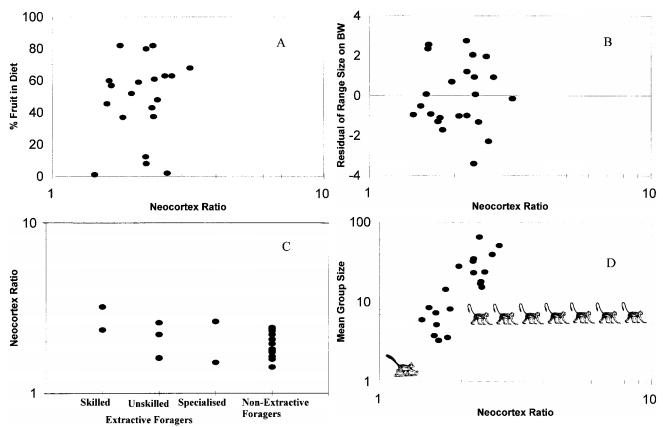 This revealed there was a striking correlation between the two, with groups that overlap a lot tending to have larger brains than those primates who live in groups which don’t overlap2. He hypothesised that the key factor here was the conflict that would ensue from having overlapping territories; prompting an evolutionary arms race amongst neighboring groups2. Chimpanzees, for example, often have incredibly violent “border wars” with neighboring chimps; often leading to one group being completely wiped out3. It’s easy to see how success in these conflicts can be paramount to survival, and how large brains could lead to success. In fact, it’s so easy to see you might be asking why has nobody thought of this before? And they have. The unique thing here is the focus on conflict between groups. Many researchers have previously argued that deceit and conflict amongst members of the same group as they try to climb the social ladder may have been a driver of intelligence4. Others have suggested that large brains help us live in large groups, helping us search a wider area for food and better defend that area against others5. Conflict between groups hasn’t really been considered as a primary factor by itself before. But as I said at the start of the article, no factor should be considered by itself. The evolution of our big brains was the result of many forces acting upon us. Where does conflict rank in all that? Was it really that important? And that’s the big problem with this new research. It makes no attempt to establish how important conflict was in brain evolution. No comparisons are made to any of the other known forces – like group size – to establish that it was one of the primary factors driving the growth of our brain2. And it’s not like that’s even asking a lot; a lot of other research does make such comparisons to establish the force they’re looking at is important5. That’s missing here. On top of that, this paper uses a relatively uncommon metric of brain size making it hard to perform such a comparison after the fact. It’s not as though we could just compare the raw data and figure out which was more important; one data set has to be converted first. And it’s not exactly an easy conversion either. There’s also the fact that at no point does the research establish that border overlap = conflict. Bonobo groups, for example, overlap with one another quite extensively yet they live together relatively peacefully6. And whilst chimps do have violent border wars3, their degree of overlap is one of the smallest identified amongst apes in this research2. So yeah, conflict was one of the factors that drove the evolution of primate brains. We just have no idea how significant a factor it was. And you also have to assume that border overlap = conflict. Now, science might be a field of caveats and uncertainty, but there’s just too many unresolved issues here. Until they’re taken care of I’m not sure we can really attribute much of primate intelligence to violence. So look on the bright side: your ancestors weren’t as awful as you thought. Boyd, R., & Silk, J. B. (2009). How Humans Evolved. WW Norton & Company, New York..
Grueter, C. C. (2014). 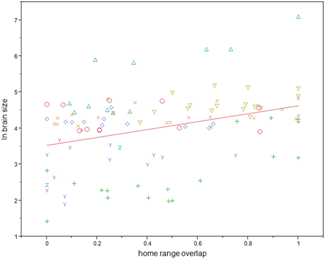 Home range overlap as a driver of intelligence in primates. American journal of primatology. Manson, J. H., Wrangham, R. W., Boone, J. L., Chapais, B., Dunbar, R. I. M., Ember, C. R., … & Worthman, C. M. (1991). Intergroup Aggression in Chimpanzees and Humans [and Comments and Replies]. Current Anthropology, 369-390. Byrne, R. W., & Whiten, A. (1989). Machiavellian Intelligence: Social Expertise And The Evolution Of Intellect In Monkeys, Apes, And Humans (Oxford Science. November 27, 2014 in Chimpanzees, Hominins, Primates. E O Wilson makes the point that altruism among members of the same group and selfishness pertaining to other groups, which can lead to conflict, is the driver of social evolution. It makes sense to me. I assume they are looking at current population and overlapping territories? Now days territory size would be more limited due to human activity, putting increased pressure on species to fight over what territory is left. During the early evolution of our ancestors, it would seam that opportunities to expand territory or move would be greater. Why risk getting killed in a fight when you can just move, which it seems like, at times, is what they did. Did they even state a correlation coefficient? This seems like another example of science being done by the non-scientific (officially degreed or not). Don’t all animals exist in a state of conflict? Yes,andh ow come Erectus stayed around with such a small increase in brain size and the Neanderthal and Sapiens experienced such extravagant development. Our warlike, barbaric nature ?